My experience with World of Warcraft is surprisingly limited for someone who considers herself an "MMO expert" (lol? ), with MMOs being almost exclusively my genre of choice since Ultima Online. I knew it would be a big deal - because Warcraft duh - but in beta, I never saw the magic. Sometime after release, still in Vanilla probably, I played a Hunter until 30 or so. My memories of it are a big foggy, so I certainly feel like I'm missing some nostalgia that other people have. After Cataclysm, I "refer-a-friend"ed my way to 70 or 80 on every class except Mage and Hunter. This involved 3 months of sitting in dungeons, rarely seeing the overworld. This means that I never saw some pivotal story quests, never met certain NPCs, and just never explored what the world had to offer. Enter Warlords of Draenor. I’ll be honest: there are essentially no MMOs that I want to play right now. They’re all early access, I've played them as much as I can stand, or they’re simply not worth the harddrive space. So with quite a few friends and guildmates making their return to Azeroth a couple of months ago, I decided to legitimately give WoW another shot. Prior to WoD release, I boosted my Priest to 90 (she was 70 previously, and okay while I said I was giving it another shot, I didn't even remotely want to grind those levels; sue me). I spent hours - probably days, time is irrelevant in this world - LFRing to get gear, to get more gear. 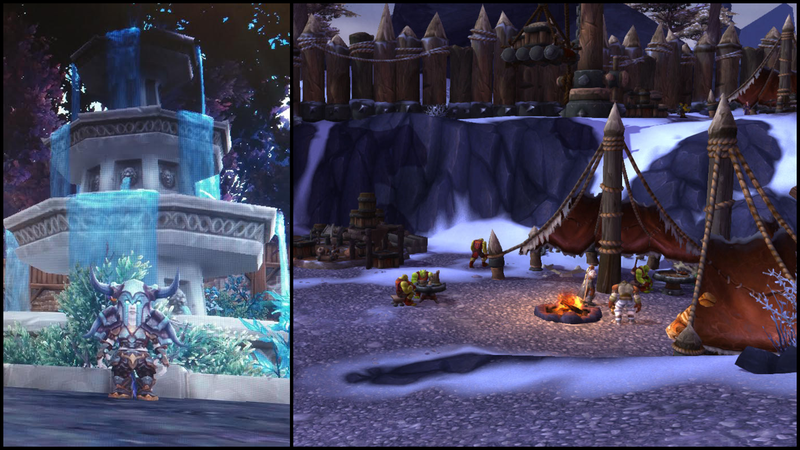 I did Timeless Isles dailies almost as if they were my new religion. Again, I didn't understand why. I was compelled to complete these objectives by some unseen force. I rarely feel enticed by gear treadmills, but here I was, excited to get armor with a different colored border. Watching my ilvl tick up by 1 when I got something new. Being giddy when my healing was more better. I didn't think I’d care about Warlords of Draenor. These characters that I know by name only are in a plight, as usual, and I’m the One True Hero, as usual. But the cinematics (while occasionally cheesy), made me care. Kill 10 quests don’t feel quite as tedious as I remember. The feeling of accomplishment is high - the desire for reward even higher. Plus, bonus objectives around each zone?! They’re my BFFs. Then there are Garrisons. Carrots are not my bag - Facebook games make me die inside just a little, and having to log in to a game to maintain something every x minutes is usually a reason for a hasty uninstall. But here I am, checking in with my followers every few hours (working from home is really great, by the way) and caring about leveling so I can upgrade my Garrison. To get more stuff. Me: Am I really going to look around this nicer Garrison and think “man, this was totally worth $60”? Other Me: Yes. Yes you will. Confirmed - Other Me was right. It is totally worth it. It goes without saying that Blizzard knows what they are doing. Without even being able to compare this expansion to the content of the others, I know that Warlords is something special. While I am not yet 100 (though I hope to be this week, on at least Horde side), it feels like there is plenty of content to complete. The zones are different enough, and last just long enough, to keep things interesting. The NPCs give me reason to care about them. There are fun easter eggs to uncover, and the quests have personality. And bonus, it has never been easier to play with friends. Cross-realm phasing is my favorite thing ever. So the answer to “why”? It doesn't really matter anymore. As long as I am still having fun, regardless of whether it is grinding out quests or assigning out my Followers, I’ll continue to explore this world that I never fully appreciated. Azeroth pulls me in a little more each day now, and I've accepted it.